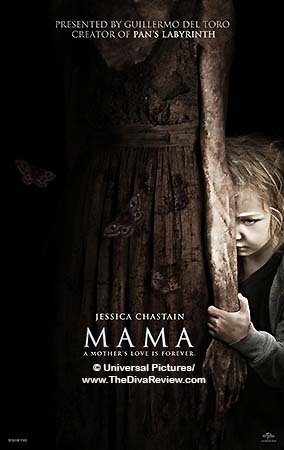 Mama is the second PG-13-rated horror movie produced by the remarkable filmmaker, Guillermo Del Toro. 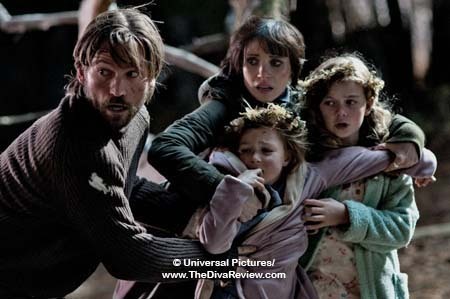 Del Toro, who knows a thing or three about what’s scary, presented 2010’s Don’t Be Afraid of the Dark, an effective remake of the 1970s made-for-TV creepfest. That film centered around a little girl as its protagonist, waging a war against things that go bump in the night. With Mama, our two heroines are again small girls, but instead of running from those nocturnal frights, they welcome them with open arms. Daddy’s lost his mind. A psychotic breakdown sees the end of the happy life of Victoria and Lilly as they knew it. Victoria is a bespectacled grade-schooler and baby sister Lilly, a mere toddler. 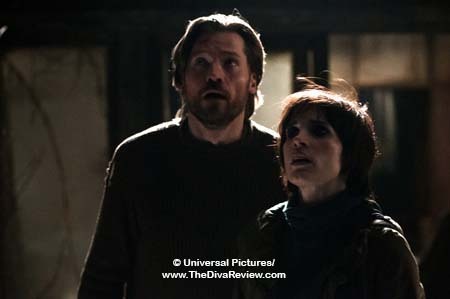 Trusting in their father even as his flight from a murderous rampage results in a car crash that strands them in snowy woods; a deserted cabin provides a safety and shelter neither child could expect. A mist, a shadow, a will o’ the wisp travels through the house and saves the children from their parent’s desperate act. The sisters are lost and alone, but find help from that kindly spectre. While they make a home of sorts in the cabin, living on the cherries and other offerings of the forest provided by their caring host, their uncle Lucas, a ringer for his lost brother, has never given up the search for his family. Luckily, neither had some of the local townsfolk who spot the cabin and find the two small, filthy creatures that vaguely resemble the missing sisters inside. Victoria and Lilly’s long-awaited homecoming is not without complications. The siblings are more like animals - snarling, feral and frightened - than little girls. Victoria has the benefit of some memories of civilisation and language, but Lilly who was barely out of infancy when they were lost is almost completely disconnected from human behaviour. She prefers to crawl on all fours and sleep on the floor, preferably under her sister’s bed, surrounded by loose branches and leaves. Still Lucas won’t give up on his nieces and brings them into the home he shares with Annabel, his tattoo-covered, bemused but steadfast girlfriend. What the family doesn’t know is that when the girls came out of the forest, they didn’t come alone; nor is their unseen new houseguest about to abandon her beloved charges. I’m sensing a theme. 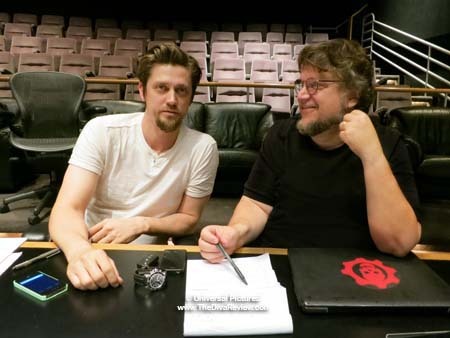 In another Del Toro-produced scarer, El Orfanato, the protagonist was a woman who was raised in an orphanage and grew up to endure the mysterious loss of her own child. In Don’t Be Afraid of the Dark, our wee heroine is dumped by her uncaring biological mother and forms a bond with her father’s girlfriend; the only person who believes her stories of dangerous, teeth-stealing little people. Here, as in that film, the male parent is sidelined and his significant other reluctantly yet wholeheartedly takes on the role of mommy. It’s lovely sentiment, but in Mama we’re faced with a battle of the moms as the girls’ initial adoptive parent, an embittered spirit who lost her own child over a century before doesn’t take well to her new babies’ growing affection for their flesh and blood caretakers. Entering the house through cracks in the windows and walls, the ghost, called “Mama” by the girls, keeps an eye on her charges and comforts them as they become accustomed to their new surroundings, continuing to play with and lead the children on outdoor jaunts. The situation around the house is already skittish with the feral kids jumping out of corners and silently crawling across floors when the grown-ups sense an extra presence moving around. One parent’s discovery of Mama leads to a painful result while the other must single-handedly face the shape-shifting spectre that won’t be happy until she owns the girls, body and soul. “Mama” herself is a smoky-black CGI creation whose various shape-shifts can be alternately creepy as she morphs into the walls and floorboards as a tentacled fiend, or ridiculous, as when it’s just her mop of long black hair chasing Annabel across the living room like something out of the gag reel from the Japanese horror film, The Ring. At her fiercest, Mama’s strange face resembles a female version of Edvard Munch’s The Scream, or like a Modigliani when being gentle with the girls. Mama never looks all that real, which takes away some of the threat. Most of the movie’s frights are of the pop-up variety, with the occasional need to yell “don’t look in the closet” at the screen. Director Andres Muschietti creates a great bleak atmosphere, full of wintery grays and whites and the monochromes of the dueling mothers, with the charcoal-coloured ghost doing battle against Jessica Chastain in a brunette boy-cropped wig and all black wardrobe. Young Lilly is played by the wide-eyed Isabelle Nélisse, who scoots around on all fours with unnerving ease more like a monkey than kindergartener. Watching her poke her head out of various hiding places like a skittish squirrel and growl like a rabid puppy, she sells the feral kid act terrifically and is great fun to watch. 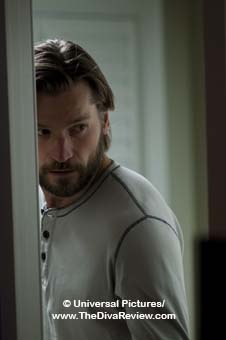 As with Don’t Be Afraid of the Dark, the males in the film are basically useless, which is a drag as our ersatz father figure is played by Nikolaj Coster-Waldau, a.k.a. Game of Thrones’ Jamie Lannister. It’s weird to see him in one romantic scene, macking on someone who doesn’t remotely look like his sister. The ladies are made to fight it out for the fate of the girls and it’s only by appealing to the instincts that haven’t changed throughout the ghost’s unfortunate existence that the sisters have any chance to survive. Or not. One might have to think poetically about the movie’s ending to appreciate it; it’s just odd and might’ve come across better on paper than watching in unfold on film. Weird resolution aside, Mama isn’t groundbreaking or particularly memorable, but as January horror releases go, it’s entertaining enough. After all, mothers can be very scary.